Actor Abhishek Kapoor returns after a long hiatus as the debutant director of Aryan- Unbreakable. 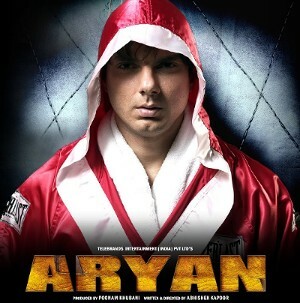 Starring Sohail Khan and Sneha Ullal (Lucky- No Time For Love), Aryan recently had a huge music launch at Raheja Classic. Although the film is generating quite a lot of buzz in the recent past, it has been long in the making. Let’s cut right to the chase. Ek Look Ek Look is the promotion track of the bunch and the one explicit chartbuster of the soundtrack. Rendered by Anand Raj Anand and Producer Poonam Khubani, this tune has the skills to stay on your play-list for quite a while. Apart from the catchy melody, ARA throws a variety of instruments into the mix, including a little rap to top it all off. Some music buffs might find this track similar to ARA’s popular Pyaar Aaya (Plan). This piece also appears in a remix version (done well by Praful Karlekar) and a dhol mix version. However, there is a peculiar legal issue behind the proper crediting of this tune. Singer Neha Bhasin (of pop band Viva) has apparently sent a legal notice to ARA stating that she wasn’t giving proper credit for the song, which she originally sung and recorded in April of 2005. ARA has credited her as the back-up vocals apparently because of pressure from producer Poonam Khubani, who is now credited for the song. ARA defends by stating that Neha’s vocals were only recorded for reference purposes. Well, the crediting side of this tune (as well as countless others) is a mess but the song itself sure isn’t. If you haven’t already heard this one on non-stop promos, then go you should already go out and by this CD. Next up we have a couple of splendid romantic pieces. Jaaneman and Rab Ne Mere are by far the prime highlights of Aryan. ARA truly outdoes himself while coming up with two melodies that are dissimilar in nature but parallel in beauty! When you have such a fragile romantic piece who better to count on then Sonu Nigam and Shreya Ghoshal. Both play off each others’ voice flawlessly. Special mention goes to the very creatively designed musical backdrops. However, although limited, inspiration continues here also. During the ‘Jaaneman Jaaneman’ refrains, ARA borrows heavily from Rahman’s rhythm in ‘Yeh Rishta’ (Meenaxi). But this can be easily overlooked as the song passes on ALL levels. Lyrics are as sweet as the voices that render them. Bravo ARA! Kunal Ganjawala and Shreya Ghoshal team up for yet another seductive journey, this time through the valleys of Rab Ne Mere. Apart from the captivating rhythm, ARA has come up with melodic gold! A bit playful, a bit haunting, ARA’s melody is so rich in nature that it will be stuck in your mind for days, if not weeks. Rhythmically speaking, from the masterful interplay of the flute to the divine mix of strings and harp. On top of it all are the perfect voices of Kunal and Shreya, which makes this track pure musical heaven! ARA’s lyrics are as romantic as they come; and he does it while straying from the conventional world of clichés. Rab Ne Mere is easily one of the year’s best and will have you pressing the repeat button constantly. Teri Te Me is literally screamed out to you by ARA, who plays a central role once again. Personally, I prefer a more sober ARA rather than the one present here. Obviously the emphasis is on force and not melody here. Seems like a filler song to me that is fair. Pamela Jain lends a limited helping voice. Lyrics are not noteworthy. The song really does nothing for the listener. Unbreakable Theme is one of the better themes composed recently (by Ranjit Barot). Ranjit Barot is, in my eyes, one of the most underrated composers we have today. Just look at last year’s Holiday, which was one of the best soundtracks to have released in 2005. Rendered very forcefully by Ranjit Barot himself, the piece succeeds mainly because it has pizzazz, style, attitude, flavor, emotion. The tremendous play of the electric guitar only adds to the energy of this Unbreakable Theme. Another positive facet of this piece is Bianca’s tender vocals. When combined with Ranjit Barot’s intimidating rendition you get this perfectly balanced theme that encompasses the power and attitude that Aryan embodies. The rap portions are eerily similar to Amar Mohil’s They Don’t Know (Ek Ajnabee). The female lyrics go something like this. “If I have to rise someday, let it be now. Rise above my fear, my lord show me how. I’m never far away. Just reach out your hand, I will be there.” Interesting indeed! It’s A Beautiful Day carries its inspiration from Dum's Someday. Rendered by Hamza Farooqui and Shreya Ghoshal, this track should find a place with the youth as it’s a sweet ‘n’ soulful tune that isn’t very demanding and is a pleasure to listen to. The mixing of English and Hindi is done such that it doesn’t seem awkward at all. Shreya Ghoshal is in top form as always, as is Hamza. There’s not too much I can add, except that I do recommend this piece. Last up is the sober ARA I mentioned earlier in Lamha Lamha. Now this is the ARA you all heard pour his heart out in Masti’s Dil De Diya. A dard-e-judaai song, the piece doesn’t carry the creative ingenuity that some of its predecessors carry. However, the piece does have a at times powerful rhythm stand behind it, supported by an echoing chorus. The melody isn’t bad either…very typical of a song of this genre. ARA’s lyrics are quite routine, with the occasional new phrase. Definitely not a bad way to end this impressive lot of songs. So, is this ARA’s best? Well, I’d say it’s way up there with the likes of Kaante and Wajahh. But one could easily argue that this in fact is his best work to date. ARA deserves a pat on the back for coming back big time with Aryan. Go get this CD, if not just for Jaaneman and Rab Ne Mere. If the music is any indication, then the film should be filled with unexpected pleasures and innovative ways. If you’re keeping track, that makes three worthwhile soundtracks so far for 2006: Aksar, Taxi No. 9211, and now Aryan.